A team of researchers, managers and ecological risk assessors review the current state-of-the-art in landscape connectivity planning, offering models, case studies and advice for coping with the uncertainty inherent in dynamic, real-world conditions in The role of landscape connectivity in planning and implementing conservation and restoration priorities published in the Ecological Society of America's 16th volume of Issues in Ecology. "The shortest path is not always the best path," said CHANS-Net member Sadie Ryan, ecologist at the State University of New York in Syracuse. "Connectivity is not always just a straight line of greenway that you can identify from an airplane." The need to move is most obvious for migratory animals and the large animals that need big tracts of territory. Most of us are aware of large and charismatic animals like deer, bear, or coyotes. But plants and smaller, less itinerant animals, also benefit from connections to wider spaces. 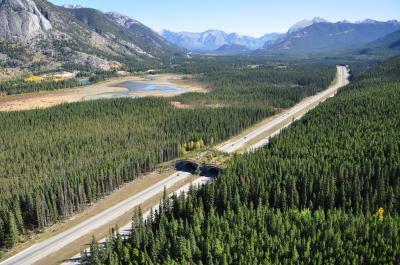 "Landscape connectivity is as diverse as the animals that live in it," said lead author Deborah Rudnick, environmental scientist with Integral Consulting Inc, in Seattle. "It's a massive amount of info to keep in your head simultaneously. I want people to step away from this review with a sense of that complexity," said Rudnick. Opening corridors can sometimes aid the flow of invasive species and disease, as well as the species at the heart of conservation planning. All management plans involve trade-offs -- whether that means obtaining the best versus the most available land, or favoring a single endangered species at the possible expense of others in its ecological community. "We are no longer living in a world where we can preserve perfect habitat," said Ryan. Climate change, and wildlife's response to climate change, is not a linear process. According to Ryan and Rudnick, humans can't expect all species simply to move to colder climes, nor expect ecological communities to move as complete units. Species have independent capacities to adapt and move, decoupled from the ecological relationships of predator to prey, pollinator to flower, or grazer to grass. "We're seeing species moving to new territory independently, remixing existing communities and shaking conservation definitions," said Rudnick. "What do we mean by 'conserving' a community? What does it mean in the face of climate change? You cannot expect a community to stay in the place that it was in the face of major changes in their environmental conditions." Models, and management, must adapt to conditions changing in real time. Flexibility is not generally a virtue of government regulations. The timescale of legal decision-making is generally much shorter than we would want in order to provide communities, both ecological and anthropological, time to adjust. Corridors and connections are often in the spaces between preserves, the mixed use spaces occupied by human communities. Bridging barriers for wildlife means bridging the needs of the people living in that landscape. It means working with communities to find solutions that are practical, and possible, said the authors, not just from the perspective of science, but also residents, farmers, and industry. A first step is finding a common language. Ryan said she doesn't talk about "ecosystem services" in rural Uganda. Those aren't Rutooro words. "We ask, 'Is the park beneficial to you?' and locals might say, 'It keeps the rain.' They perceive benefit from the park, but don't describe it like a scientist. The same is true of English-speaking communities." "You build your models," said Rudnick. "Then you try to put them in the real world. Community needs -- that is, human community needs -- add a whole layer of complexity to real life implementation." Besides Ryan and Rudnick, other authors are: Paul Beier, Samuel A Cushman, Fred Dieffenbach, Clinton W. Epps, Leah R Gerber, CHANS-Net member Joel Hartter, Jeff S. Jenness, Julia Kintsch, Adina M. Merenlender, Ryan M. Perkl, Damian V. Preziosi, and Stephen C. Trombulak.